In a country where information is not free, VPN (virtual private network) is a way to puncture the Great Firewall of China. Usually a technology only familiar to IT types who use it to access their servers, here in China, VPN is a way to circumvent the iron curtain via this “hole in space.” While most of the Chinese netizens seem content with the local social media, many foreigners and determined nationals have rerouted their computers beyond the Eastern side of the digital divide. This essentially means that banned Western social media such as Facebook, YouTube, and Twitter can be accessed. How much censorship is avoided is not all together clear, but since social media is by nature designed to facilitate a global conversation, VPN is definitely a step in the right direction. It also seems as though this form of access accelerates data to undermine the intense filtering that goes on here in China. While the Net was originally designed by the US government as an open, distributed information highway to keep lines of communications open during nuclear attack, here, the Chinese government has attempted to force its authority on the Internet to keep a tight grip on the flow of information. Information wants to be free, but not here. The Internet has been transformed into a fickle monster here in China with the authorities riding the virtual break on the movement of data. This Orwellian grip on the network is most likely a lost cause. The Internet is simply too flexible, too international, too hackable to keep under a governmental thumb. This is good news for humanity though, and perhaps a way to really spread freedom throughout the world in a non-militaristic, multi-cultural, bottom-up way. In a society founded on the Marxist doctrine of raising the middle class, the net may just be the real force of change in a 21st century China. 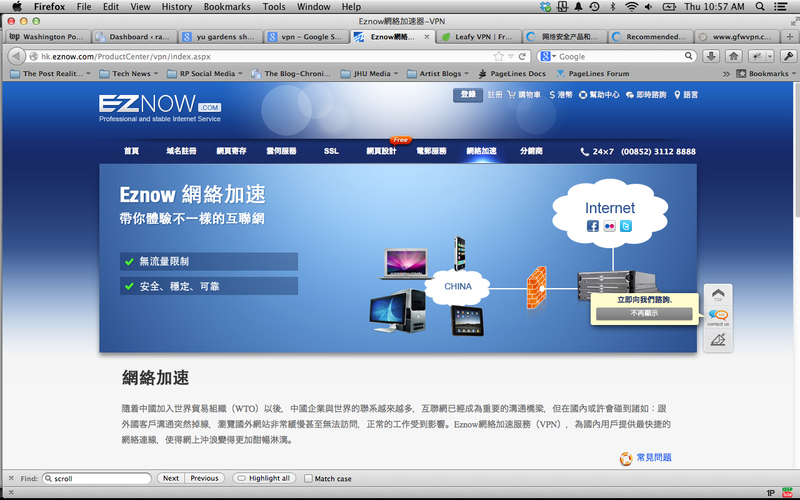 The next revolution here in the People’s Republic will no doubt be netcasted via VPN.